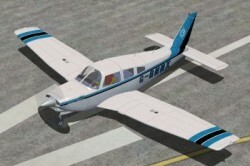 Flight Simulator X-SP2 turbo Piper Arrow-III PA28RT-201, in U. S. and U. K. liveries. Model made in GMax. Panel with xml gauges, in part tailored made. Pilot with animations. Opening passenger and cargo door. By Rien Cornelissen. FSX SP2 turbo Piper Arrow-III PA28RT-201 U.S. Rating: 8.00 of 10 over a total of 1 reviews. This attractive model appears to have a fully functional virtual cockpit.